Who doesn’t like pearly white teeth and a beautiful smile? So what are you doing to ensure your smile is a happy healthy one? During this month of Health and Wellness I have scheduled my appointment with my dentist for my professional cleaning. Going to the dentist regularly will help avoid (but may not prevent) cavities and gum disease and will keep your teeth healthy. Now I have never hated or feared the dentist, I just don’t particular care to go to the dentist. For me it has more to do with the unsettling, high pitched zzzzzz sound coming from the dental instruments. They have a tendency to cause me to hold my breath and squeeze my hands while my heart increases in beats per minute. It’s the psychological thought of the possibility of a nerve being hit. That thought of what could happen is enough to cause a slight panic. But if I have a toothache, I don’t care about the sounds, all fear is tossed aside as the main focus is the relief from this place of agony resonating in my mouth. And I’m sure you are in agreement that no matter how much you hate or fear the dentist, a toothache will send you to a dentist quick, fast and in a hurry. I am fortunate to have a wonderful dentist, Dr. Quanda Johnson DDS. Dr. Johnson is very knowledgeable and she also has a passion for the work she does and has the ability to place you at ease and make your fears go away. Because she cares about her patients she will also call you out for not following the preventive care that could have potentially avoided the toothache that is now causing you to run into her office looking for relief. She is invested in your oral care and holds you just as accountable for maintaining it. Dr. Johnson leads by example and her staff is wonderful as well. They are professionals who are friendly and caring, engaging and will make you smile. 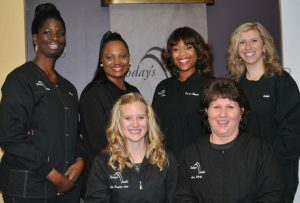 The complete staff is invested in your oral hygiene treatment. Dr. Johnson and her staff will work with you and establish a treatment plan best designed for the health of your teeth. They also take into consideration the financial aspect or concerns you may have and will work with you on an action plan that you are comfortable with. They are here to help you in every possible way. Visiting Dr. Johnson and her staff is like spending some time with some good friends. You are going to have some conversation, catch up a bit, get some work accomplished and leave smiling. What I really love about Dr. Johnson and her staff is that once you are gone, they will follow up with you to see how you are doing. There was a time when I had a procedure and still had discomfort after a couple days. The office cared enough to follow up with me until the discomfort was gone and I felt better. If you are looking for a “family” dentist don’t bother calling 1-800-DENTIST…Dr. 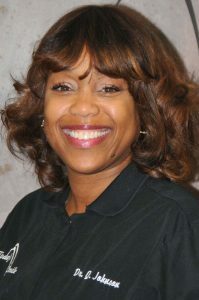 Quanda Johnson DDS is on our list.